The Wisconsin Veterans Museum is rich with stories of World War II veterans who eagerly and patriotically answered the call to service following the December 7, 1941 attack on Pearl Harbor. Fewer are the accounts of Wisconsin service members who had already enlisted prior to the decisive moment in history. Because of the scarcity of such collections, the museum is privileged to have recently received the highly comprehensive collection of Rhoda Ann Ziesler, a Manitowoc, Wisconsin native who served in the Army Nurse Corps beginning in 1940. Not only was Captain Ziesler one of the first–if not the very first–nurses from Wisconsin called to active duty, chance had stationed her on the island of Oahu on that fateful day, making her a firsthand witness to the harrowing event and its aftermath. Ziesler had begun her nursing career at Manitowoc’s Holy Family Hospital. When she later signed up to assist the Red Cross, she was asked to indicate whether or not she’d between willing to serve her country, a question she answered in the affirmative. Ziesler then entered the Army Nurse Corps on December 16, 1940, almost one year to the day before the Pearl Harbor attack. 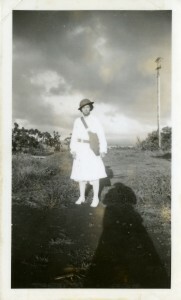 During November of 1941 she was transferred from her training grounds at Camp Custer, Michigan to the 215th General Hospital located at Schofield Barracks in central Oahu, appointed head nurse of a 112 bed ward. During this time she served as the assistant to the chief nurse for the 600 bed hospital as well as acting supervisor of six other nurses. Ziesler’s collection represents both ends of the spectrum of her service experience, from souvenirs reflecting a carefree tourist to those that document the realities of day- to- day existence while at war. Souvenirs given to the museum include a carved wooden blossom-shaped perfume holder still scented by its original ginger blossom contents, a full length native grass “hula” skirt, several Hawaiian-themed linens and a cloth sugar sack from the nearby Honolulu Plantation Company. 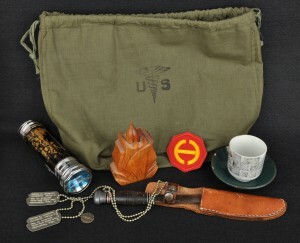 Donated objects also include her uniform, watch and wallet, as well a flashlight retaining its original blue cellophane used during the strictly-enforced nighty blackouts on the island. She also returned with the hunting knife her father gave her before leaving, having alternatively hidden it in her girdle or beneath her pillow for her full tenure stating “they’re not taking me alive” in the event of an invasion. Ziesler remained at Schofield Barracks through the rest of the war, her care given to numerous ailing service members likewise documented in other pieces she brought home, including a Japanese teacup recovered from the ruins of Okinawa given to her by a grateful Marine. The nurse also returned with another souvenir of sorts—a friendship with fellow Wisconsinite soldier Raymond Weller—that turned into a romantic relationship after their return home. In 1948 they were married and went on to have four children, one of whom, Dennis Weller, donated this collection. Ziesler’s experience is a reminder of the important role ordinary people played in extraordinary times. 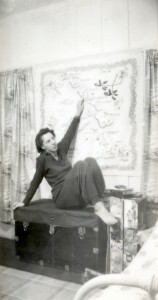 The completeness of her collection—which further consists of her diary, various ephemera, letters, scrapbooks, and even a recording of a radio interview she did while still stationed in Hawaii—gives the Wisconsin Veterans Museum a unique and significant means to continue to share her story for years to come.